Chandra Shekhar Verma, chairman of Steel Authority of India Limited, India’s largest producer of the ferrous metal, will tell any inquirer to navigate through the World Steel Association data for 2013 to get an insight into the regions which will stay in the forefront of global steel production and consumption growth. “Over the past many years through periods of high growth rates followed by a frighteningly long world economic crisis triggered by 2007/08 economic recession and now finally green shoots of recovery seen in the US and Europe, Asia has led growth in global steel production,” says Verma. World steel production last year was up 3.5% to 1.6 billion tonnes defying setback in output in European Union and the US. Progress in global steel production became possible principally on the back of China where, to the surprise of many, experts the steel growth engine was very much at work. While steel production in China in 2013 rose by 7.5% to 779mt (million tonnes) that in Japan was up 3.1% to 110.6mt in one more confirmation that Abe economics is at work and in India by an even healthier 5.1% to 81.2mt. One point of disappointment was South Korea, which has path-breaking Corex and other steelmaking technologies to its credit, where production dipped 4.4% to 66mt due to largely to industry restructuring. The dominant might of Asia in the world steel industry is evident in its cumulative 2013 production of 1.08 billion tonnes. And China alone had a share of 46.7% of last year’s global steel output. Venting a common global concern,Verma says the world steel industry remains structurally impaired because of high excess capacity as use of 78.1% of installed capacity last year would show. When so much excess capacity is floating around even after some major industry restructuring in the West carried out by way of scrapping ageing high cost blast furnaces and rolling mills and retooling of struggling businesses, the pricing power of steelmakers stays compromised. The restructuring has been led from the front by industry leaders ArcelorMittal with 6% share of global steel production and Tata Steel, which bought Corus at top dollar price of $7.6 billion in 2006 becoming the world’s sixth largest steelmaker. The others too, particularly in Europe and the US have shed quite a few haemorrhaging plants braving opposition from trade unions and governments. ArcelorMittal’s brush with the French authorities over its move to shut two loss-making blast furnaces at Florange in Lorraine in November 2012 degenerated into trading of charges where logic of economics was sacrificed at the altar of political convenience. The group has also clashed with politicians and unions in Belgium over steel business restructuring. For chairman Lakshmi Mittal the taste of pudding is in the eating. The confirmation of this is in his observation that the steps taken in recent periods to strengthen the business are giving positive results. ArcelorMittal EBITDA (earnings before interest, tax, depreciation and amortization) for 2013 recorded an improvement of 10% on an underlying basis to $6.9 billion. Equally importantly, the company, which made steel shipments of 84.3mt and iron ore despatches of 59.7mt, had a positive cash flow and ended 2013 with net debt of $16.1 billion, the lowest since Mittal acquired Arcelor in 2006. ArcelorMittal packs in itself capacity that is more than the combined capacity of the next two big producers. Naturally, it is seen as the broad gauge for the health of the industry. So when Mittal says that he is “cautiously optimistic” about the prospects for steel in the current year when the company EBITDA should rise to around $8 billion, other producers see hope. The change in the underlying sentiment becomes evident when Mittal declaration is seen against his saying a year ago that the “challenges” would continue after a disappointing 2012. World overcapacity has not deterred ArcelorMittal to selectively restart projects mothballed in the wake of breakout of the much dreaded recession. 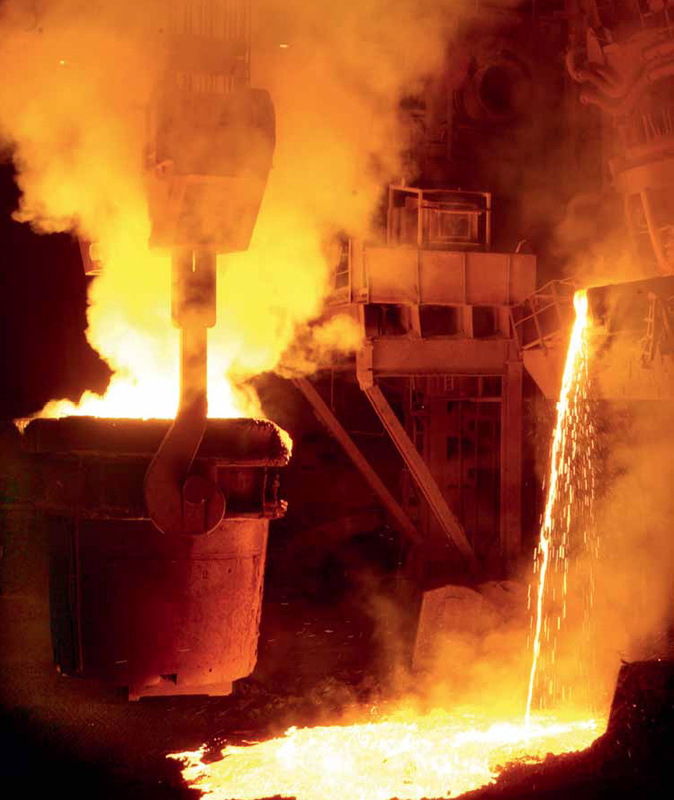 As it thought time was ripe for expansion of a Canadian mill dedicated to making auto grade steel and Brazilian operations supplying materials to infrastructure projects, ArcelorMittal has regained traction to scout for and buy operating assets. In equal partnership with Nippon Steel & Sumitomo Metal,ArcelorMittal recently bought a 5.3mt finishing mill from ThyssenKrupp in Alabama in the US designed to make high grade coil. Ahead of the $1.55 billion deal, it was a complex protracted dance of some steel biggies in which among other participants were Nucor of the US and CSN of Brazil. One gets an idea of value destruction in the steel industry in recent years as ThyssenKrupp had to sell Alabama finishing mill at a big discount to its building cost. The ownership of the mill with the Japanese partner acknowledged as world leader in steel technology will further reinforce ArcelorMittal’s leadership status in automotive steel in North American market where it already has 40% share. The market buzz now is ArcelorMittal is showing interest in buying part or all of Italian steelmaker Ilva, which owns Europe’s biggest steel plant in the southern Italian city of Taranto. Controlled by the Riva family, Ilva makes flat steel finding application in automobiles to electric appliances to shipbuilding. The world’s largest steelmaker wants a part or the whole of Riva because that would give it levers to control prices in southern Europe. Expect ArcelorMittal to only eye for assets that will fit in nicely with its existing operations and give it a bigger share of a market. The takeover specialist that he is, Mittal, if he could help it, will not let go of the opportunity to acquire capacity at the present bargain prices. The rub will, however, be in large volume imports. Countries, including the US are finding occasions to invoke anti-dumping investigations leading on many occasions to levying of anti- dumping taxes on imports of steel products in order to give protection to domestic steel producers. High production leaving considerable surplus for export and its price advantages smacking of hidden subsidies have made Western importing countries and also Australia and Indonesia to look at China with suspicion. At the same time, Japanese steel products are now targets for anti-dumping investigation into 27 categories of steel in as many as nine countries. Paradoxically China, which has the largest number of anti-dumping investigations to its credit, says it is victim of Japanese export of ‘high class iron pipes’ at a discount to production cost.Washington goes on receiving complaints that China is dumping steel sheet in the US hurting the interest of local producers. According to an official with financial services group INTL FcStone,“spreads between US and overseas steel (perhaps hinting at China) have gotten to the point when even customers who don’t normally import steel just can’t say no. The discount just got huge.” Nomura Holdings says steel from China is trading at a discount to US prices for the longest stretch since at least 2006. Very high production and therefore, excess supply is the reason for comparatively low prices of Chinese steel. Nomura thinks cheaper overseas supplies will lead to 3.4% rise in the US steel imports in 2014 on the back of 2% import gain last year. Mittal is hoping for a 4% expansion of the US steel market this year and a more modest improvement of 2% in EU. If there is a slowdown in consumption growth in China, as Mittal fears, then it will be under pressure to step up exports. In any case, China has got off to a slow start with both HSBC and NBS purchasing managers’ indices registering falls in January. Standard & Poor’s says Chinese growth rate in 2014 could be 7.4% followed by 7.2% next year against 7.7% achieved in 2013 beating the target of 7.5%. Beijing inspired slowing economy combined with anti-pollution and austerity campaign will be the reason for arresting the growth of Chinese automobile industry to 10% in 2014 to 23.8 million cars and light trucks, down from 14% last year. Most experts are saying Chinese steel production growth rate will be down to 4% this year against 7.5% in 2013. But the important thing is, the growth will happen on a large base of 779mt. The world steel industry is keenly watching as to what extent Beijing will be successful in scrapping unviable and environment damaging capacity in the face of opposition from provincial satraps. Moreover, as the Chinese steel industry continues to work at losses or on very thin margins, Beijing will continue to push for consolidation through M&A. China is deftly manoeuvring a soft landing for its economy by progressively moving away from investment to services and consumer spending driven growth. Among other things, this will mean its steel demand growth will be 3% in 2014. In a long time, China’s steel demand growth will trail the rest of the world’s 3.5%. This forecast by World Steel Association means China will come under increasing pressure to export as much steel as possible to avoid any further erosion in domestic prices. The Financial Times poll of a group of steel analysts reveals that a rebound in steel production in the rest of the world will compensate for a slowdown in Chinese growth. The six-year-old production decline in Europe bottomed out last year. The FT survey says Europe will be registering a 2.4% year-on-year output growth in 2014. Such optimism finds resonance in ArcelorMittal CFO Aditya Mittal saying that steel demand in Europe is rising beyond what would amount to “just a restocking effect... We are seeing real demand improvement. We think it will have more momentum in the second half and we see industrial activity rising and construction stabilizing.” Remember both had declined in 2013. Confirmation of European turnaround is in purchasing managers’ indices hitting two year highs. The possibility of revival of capacity rested earlier in the wake of signs of demand revival after years of its destruction, particularly in the West is clouding the prospect of improvement in steel products prices. The prospects for Brazil’s steel industry are continuing to improve, as the weaker currency encourages exports and limits imports, writes Patrick Knight. After a difficult few years, when a strong Brazilian currency encouraged imports and handicapped exports, the country’s steel industry is looking forward to better times. The Brazilian Real has fallen by almost 20% against the US$ in the past two years, and this is having a major impact on the steel industry — partly direct, partly indirect. The situation was at its worst in 2010, when 25% of all the steel used in Brazil was imported, and exports found it increasingly difficult to compete in markets such as the United States, notably with that from China. The economy of the United States, in recent years the leading market for Brazilian steel, was at a low ebb, with the motor industry there making many fewer cars than usual. Last year, almost half of the nine million tonnes of steel which were exported — most of it slabs, the rest mainly flat products — went to the United States. With 16 million cars to be sold in the US this year, compared with 12 million a couple of years ago, Brazil’s steel exports will almost certainly have another good year in 2014. It costs more than average to make steel in the United States, so about 30% of the 100mt (million tonnes) of steel used there each year is imported, with Brazil second only to China as a source. The good news from the United States encouraged Arcelor- Mittal to start up the third of its smelters at the giant Tubarao mill in Espirito Santo state at the end of 2013. This is the first time since 2008 that all three furnaces at the Tubarao complex will be working, taking output there, most to be exported, to 7.5mt. Slabs are the most popular of Brazil’s exports and many of those exported by Mittal will be used at a mill in Alabama, in the US, bought from ThyssenKrupp by Arcelor-Mittal in 2013. This sale came as something of a surprise, as it had been planned for the Alabama steelworks to import most of the slabs it will need from Thyssen’s 5mt-capacity ‘Altantico Sul’ mill, in Rio de Janeiro state. Although Arcelor-Mittal is still a possible buyer of the Altantico Sul mill as well as the one in Alabama, this may well not happen. Bids from Brazil’s CSN company, anxious to become Brazil’s leading steel maker, as well as the Ternium company, owner of the Usiminas mill, have been turned down by ThyssenKrupp as being too low. ThyssenKrupp is now concentrating on improving productivity at a mill in which the Vale company has a 27% share. Atlantico Sul cost US $8 billion to build, far more than it will sell for. A total of 34.2mt of steel was made in Brazil last year, by an industry whose mills have capacity to make more than 40mt. The 70% utilization rate is slightly less than the world average of 74% last year. Because imports have fallen from their 2010 peak, 22.8mt of the steel made in Brazil was used on the domestic market, 5.4% more than in 2012. Because imports of all kinds are becoming steadily more costly, Brazilian industries are making and using more components than they have in recent years. This is good news for Brazilian steel. Taking imports into consideration and discounting exports, a total of 26.4mt of steel was used in Brazil last year, 4.8% more than in 2012. This increase was much greater than that of the economy as a whole. Of the steel sold, 12mt were flat products, the main markets being the buoyant motor industry as well as for consumer durables, while 10mt was long products, used largely by the construction industry. Construction was given a boost last year and early this, by the building of 12 spanking new stadiums and associated works for the World Cup, to be held in Brazil in mid-year. Concerned with the fact that the relatively strong Real had encouraged a flood of imported cars, the government raised the tax on imported vehicles early in 2013. In return, it gave companies prepared to build brand new factories to make them in Brazil instead, a series of incentives to do so. Half a dozen companies, including Land Rover, Mercedes, BMW, Audi and some Chinese companies have taken the bait, as have some truck makers. The tax caused car imports to fall last year, which is why more were made in Brazil itself than ever before, even though slightly less were sold in the country as in 2012. Some of the tax incentives which have encouraged vehicle sales in Brazil in the past few years have been withdrawn this year, so slightly fewer cars are expected be sold this year than last. But the steel industry expects to sell much more to the oil industry, for building several huge production platforms, drilling equipment and oil and gas pipelines for Brazil’s ambitious oil expansion programme. About $50 billion will be spent each year by the oil industry for the forseeable future. But this should result on Brazil being self sufficient, possibly becoming an exporter of crude oil and more products, by the mid-2020s. The government has also woken up to the fact that not enough has been spent on building new roads, railways and port installations, and making waterways more navigable by installing locks in the past 20 years at least. Spending more on the crumbling infrastructure has become increasingly urgent. The poor state of roads and the lack of railways means it costs five times as much to get the grains grown in the west of Brazil to ports and onto ships as it does in the United States or Argentina. This situation is tolerable when grains prices are as high as they have for the past few years. However, grains prices have a habit of falling as well as rising, and they are now slipping. As well as spending on the infrastructure, numerous large new hydroelectric power stations will have to be built in the next few years, as will major transmission lines, all of which will require large amounts of steel. Whether the improved prospects will encourage the big steel companies to consider a new round of expansions, remains to be seen. As it is, joint venture mills are planned at ports in the North East, by both Cosco and Dongkuk, both in partnership with Vale. Until ThyssenKrupp sells its Atlantico Sul mill, however, it is difficult to see any Brazilian owned company deciding to build a brand new mill. Perhaps surprisingly, Brazil’s steel companies generally now make more profits from the sale and export of iron ore than from their steel making operations. Until a decade ago, even though they had mines of their own, most companies preferred to buy their ore from Vale or from the companies Vale has swallowed up in recent years. Because Vale has given priority to exporting, and also because the world price of ore has increased so much, all the large companies, led by CSN, which exported 7mt last year, as well as Usiminas, Gerdau and Arcelor-Mittal, now get most of the ore they need from their own mines, and have plans to export a surplus.